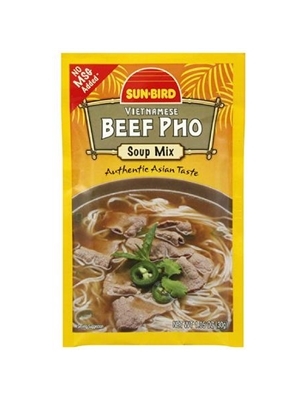 This classic Vietnamese staple has been recently reformulated to persuade your taste buds into another soothing bowl! Combine water and soup mix. Bring to a boil, stirring occasionally. Add meat slices. Boil on medium heat for 1 minute then turn to low for 5 minutes. Serve over noodles and garnish with cilantro, bean sprouts, chili peppers or lime wedges. Salt, Beef Broth, Sugar, Beef Stock, Maltodextrin, Spice, Yeast Extract, Beef Tallow, Hydrolyzed Vegetable Protein (Corn, Soy, and/or Wheat), Contains Less than 2%: Potassium Chloride, Chives, Dextrose, Calcium Lactate, Thiamin Hydrochloride, Disodium Guanylate, Caramel Color, Disodium Inosinate, BHA, BHT, Citric Acid, Lactic Acid. Contains Allergens: wheat, soy. May Contain: milk, egg.